My friend Carol, sent me some beautiful Cottage Gardens embroidery floss in a variegated colour called Tulip. Fuschia, yellow and green. Perfect colours for stitching a mountain of crazy cats, right? 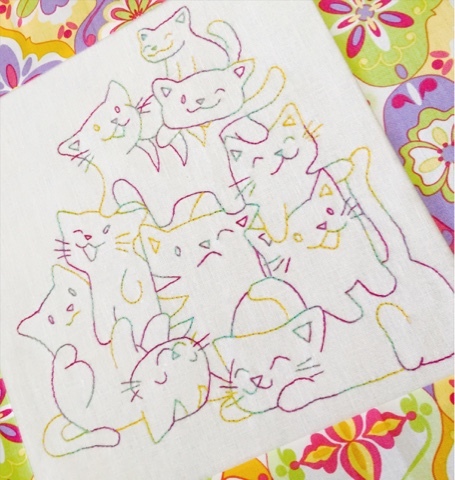 I purchased this stitchery pattern from Urban Threads (along with many others) and enjoyed stitching these quirky felines on a lovely, soft hanky linen. 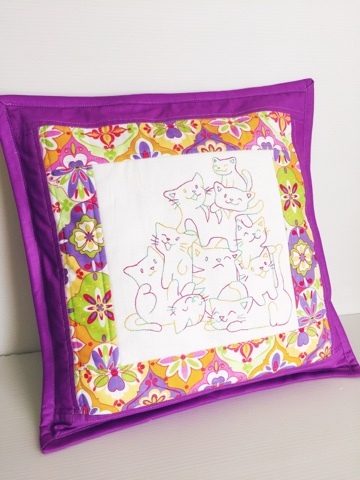 The first border fabric in this pillow is from the extravaganza range by Lila Tueller for Riley Blake Fabrics and the second border is a medium purple solid which I had in my stash and works quite nicely with the print. I simply adore stitching on linen - it's such a luxury. Do you have a favourite fabric you stitch with? How cute is that! Love the embroidery. Love your Kittens.Wish it was a Free Pattern They are beautiful in the Tulip colors Made me smile too look at them.